Child Deaths Rise As Syria's War Progresses : Goats and Soda A new study raises "serious questions" about the war-fighting methods in Syria, researchers say. In particular, one weapon has been used almost exclusively on civilians. 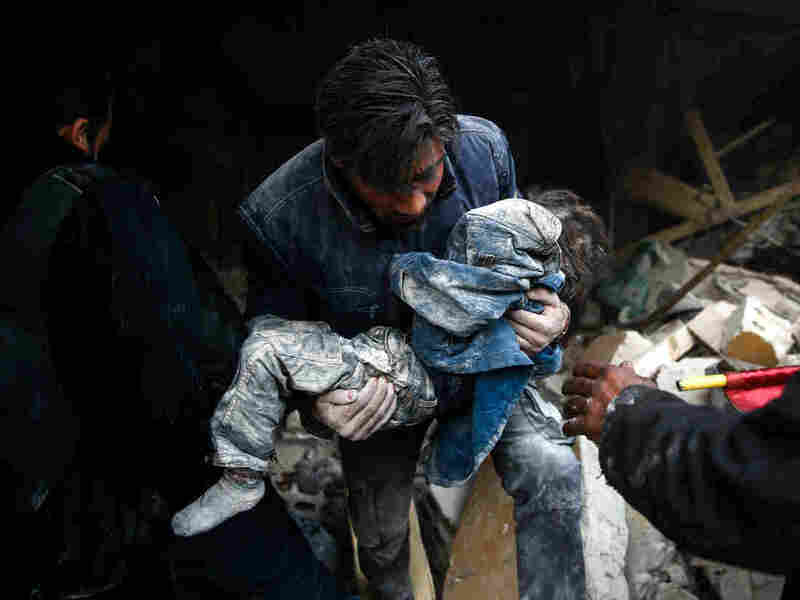 A man evacuates a child from building destroyed by airstrikes in Douma, Syria, in January 2016. Researchers have strong evidence that bombs in Syria were targeting civilians, including women and children. In the past seven years, barrel bombs have killed civilians almost exclusively, an international team of scientists report Wednesday. Civilians comprised 97 percent of the deaths from these bombs. "That is a very big deal," says Debarati Guha-Sapir, an epidemiologist at the Universite Catholique de Louvain in Brussels, who led the study. "Governments are either missing combatants on purpose, or they have very inept war strategies." The study also finds a dramatic rise in the number of children killed as the war has progressed. Children represented a small proportion of deaths, about 9 percent, in the first two years of the war. But since 2013, that proportion has more than doubled. Now nearly 1 in 4 civilian deaths are children, Guha-Sapir and her team report in the journal Lancet Global Health. "This increase is directly associated with the use of aerial bombings," Guha-Sapir says. "We conclude that the use of bombs ends up targeting children and women more than targeting combatants." In the late 2000s, Guha-Sapir was instrumental in documenting war crimes and genocide in Darfur, Sudan and testified about her findings at the Hague. "I've analyzed data from Iraq, Darfur, the Congo — places with very problematic wars," she says. "Deaths of children were usually associated with lack of access to medical care, vaccination, postnatal care because of the war. By and large, children did not die directly because of war weapons." That's not the case in Syria. So far, at least 14,000 children have been killed in Syria by snipers, machine guns, missiles, grenades, roadside bombs and aerial bombs. About a thousand children have been executed. And more than a hundred were tortured and then executed. "The impact on the civilian population is unusually high — much higher than what you would expect in a war in which soldiers are fighting soldiers," says Dr. Madelyn Hicks, a psychiatrist at the University of Massachusetts Medical School in Worcester, who contributed the study. In particular, barrel bombs have been especially deadly for children and women. Children have comprised nearly a third of all deaths from barrel bombing. "That percentage is really unacceptable," says Dr. Hani Mowafi, at Yale University, who wasn't involved in the study. "These are weapons that can be used really only on people who can't fight back." What Will Winter Bring For Syria's Refugees? A barrel bomb is essentially a large metal container filled with explosives and shrapnel. They can be incredibly powerful, decimating entire city blocks. But they are very imprecise weapons. "Many times the barrel bombs are simply dropped from low-flying helicopters onto densely populated parts of cities," Mowafi says. "You couldn't drop them onto combatants because they would simply shoot down the helicopter." Instead, barrel bombs are used to terrorize families and convince them to leave a city, Mowafi says. "We've seen barrel bombing of hospitals, which are clearly marked. We've seen barrel bombing of people queuing up to get bread." The new study raises "serious questions" about the war-fighting methods in Syria, Mowafi says. In particular, whether or not governments are really trying to differentiate between civilians and combatants with aerial bombs. "The findings in this study are really important because the authors have adhered to international standards for reporting on war deaths," Mowafi says. "It is very difficult to do this type of study well, and the authors have done a really good job." In the study, Guha-Sapir and her colleagues analyzed data documenting the deaths of nearly 150,000 people in Syria from 2011 to 2016. About 70 percent of those deaths were civilians. The data come from a group of activists inside Syria, called Violations Documentation Center, dedicated to documenting deaths caused by war weapons. The group has a network of volunteers which rush to a site of an attack and begin collecting information about who died. They document the person's age, gender, military status and how they died. The group reports its data directly to the U.N. Security Council. "They have a very robust data set," Mowafi says. "The group often collects information within hours of a death, and then they corroborate the information with independent reports." The data are not comprehensive, he notes. VDC documents deaths only in regions not controlled by the government because the group has access only in those regions. "And the VDC only includes deaths when they can corroborate the information," Mowafi says. "Clearly more people have died than are reported here, but the study represents one of the most complete accounts of war deaths in the Syria to date."